This year marks my 20th year of making zines. I started making zines in 1999 as a way to connect with people. Quite simply I had no friends. 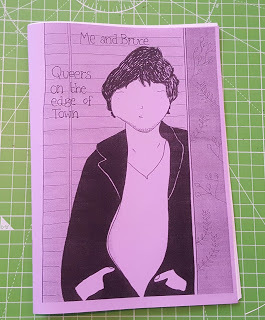 I was a lonely teenage queer in a small town and in lieu of what the internet would later become, zines were a physical and tangible presence which arrived through my letter box. They were a dispatch from out there which said 'you're going to be ok, there are more people like you, you aren't alone.' I'm not being dramatic when I say zines very much saved and changed my life. 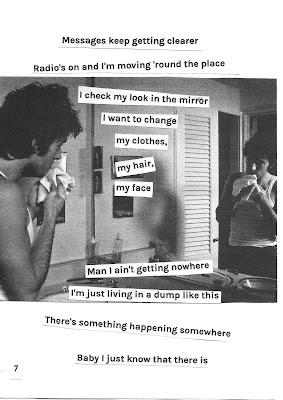 'Theres something happening somewhere...' taken from Me and Bruce #4: Queers on the Edge of Town zine. Cut to now and I've just returned from a week long residency in Hong Kong with Asia Art Archive. 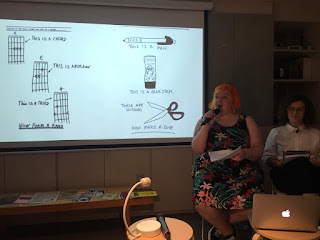 I was there along with the wonderful Nicola Cook and Loesja Vigour repping the UK and Ireland Zine Libraries group as well as the libraries we both work at as part of our day jobs which include zine collections. 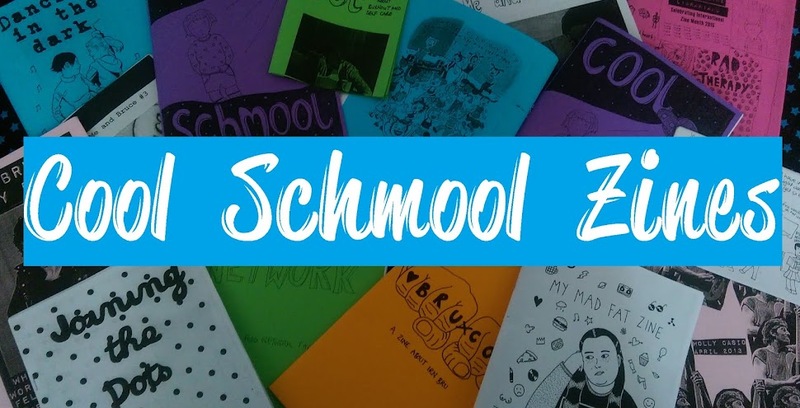 When I started making zines 20 years ago I could have never predicted the ways zines would continue to change my life and the communities they would connect me with. Loesja, Nicola and I with just some of the artists, activists, and librarians we met. 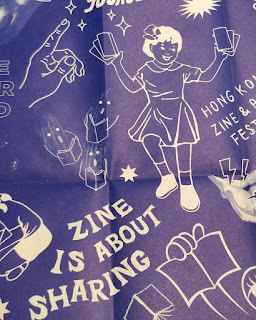 Nicola, Loesja, and I were invited on this residency to share ideas, resources, and knowledge around zine libraries and to connect with the Hong Kong diy zine scene. 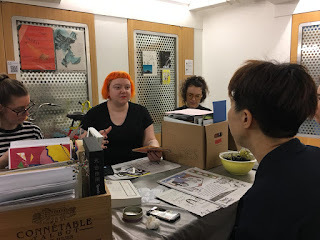 Nicola and Loesja established the zine collection at Wellcome Library, and I co-founded the zine collection at Iniva's Stuart Hall Library with Sonia Hope. 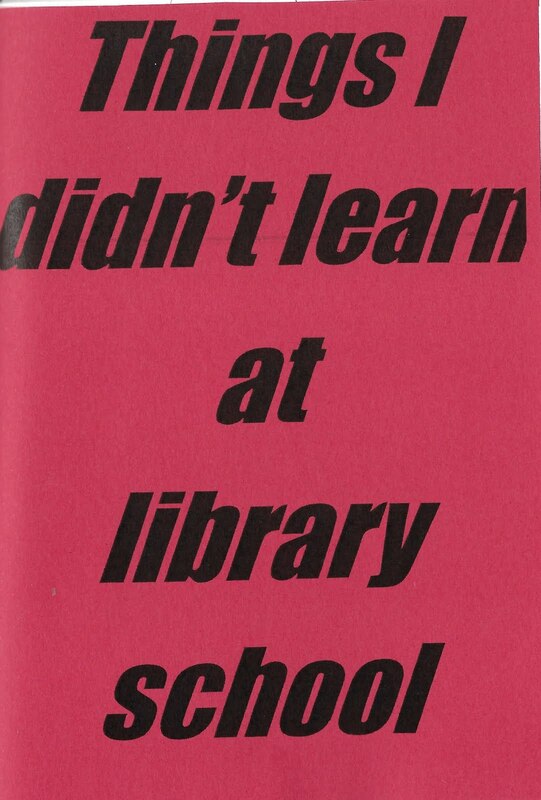 I also established the zine collection at Tate Library as well as co-founding the UK and Ireland Zine Libraries group with fellow zine librarian Leila Kassir. Despite all that plus 20 years of making zines, imposter syndrome was high. A full report of the residency will be coming on the UK and Ireland Zine libraries blog, and of course there will be a zine to follow (there's always a zine). But for now I want to just make a note of my immediate take aways from this whole experience. Meeting with Beatrix from Small Tune Press and Zine Coop, and visiting the current home of Queer Reads Library. My main take away is what a total privilege it is to be able to sit and think and chat about zine libraries and diy culture for a whole week. 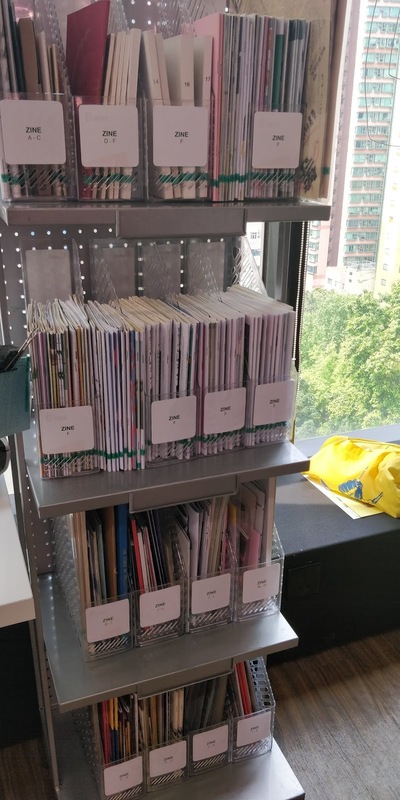 In the institutions where we work, the zine collections are low on the list of priorities. Zines make up just 0.1% of the overall library where I work so they aren't prioritised, and as staff and resources are limited, it's easy for other aspects of the collection to steal focus. But to have a week where zines are the main focus, where we take the time to consider ethical practices around collections and cataloguing is honestly such a dream. It made me think about the responsibilities of institutional libraries and organisations. As both a zinester and a zine librarian, my thoughts can be quite contradictory. I'm often cynical of large galleries, museums, and universities engaging with zine culture. Is it a quick and cheap way to tick a diversity box? Is it a quick attempt to reach a youth demographic? Is it a style and aesthetic which can be used then thrown away? And I mean quite literally thrown away - I mentioned in a previous blog post that after one particularly inspiring and creative zine making workshop I hosted for a large UK art organisation last year I saw the results of that workshop collected and thrown in the bin by a curator, despite attendees being told that their zines would be collected and added to the collections. What is the legacy of these events? Zines may be low cost and ephemeral but their content and reason for existing matters. 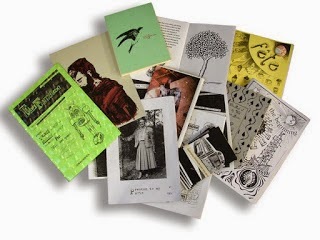 Art organisations, museums, and universities have a responsibility when collecting zines. Zinesters shouldn't feel privileged that their zines are collected by museums and galleries, in fact those institutions should recognise what a total privilege it is for those zines to be used or collected in their organisations in the first place. 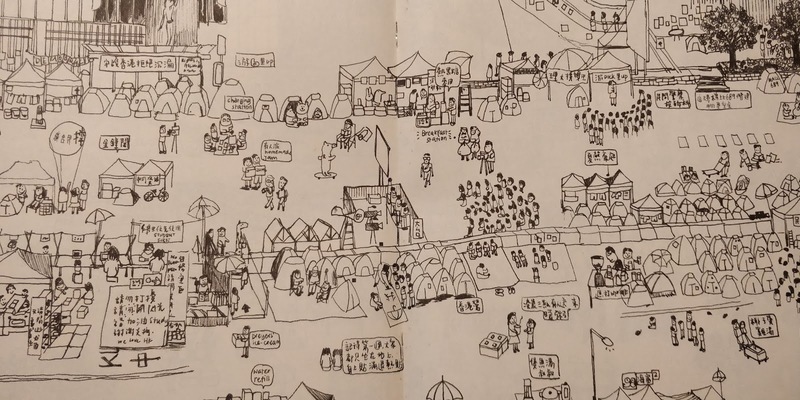 Page from a zine published during the 2014 Umbrella Movement. 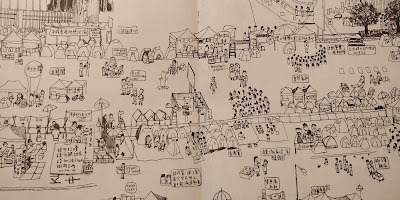 This zine maps the spaces occupied by activists. During my residency I met so many artists, activists, zine makers, and librarians, all genuinely connecting with each other. 'Authenticity' became the watchword. Do organisations working with zines interact and engage with diy culture in an authentic way? 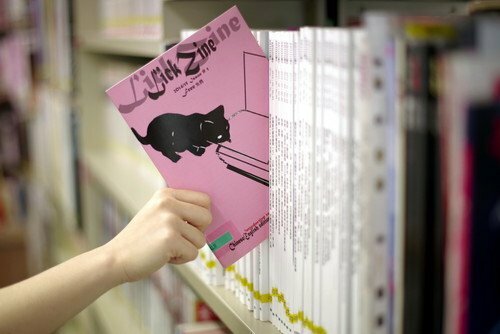 Are institutions making efforts to develop and nurture zinesters and zine culture? Similarly do art organisations know when to back off and let diy culture evolve on its own? What do zine artists get out of this deal other than the privilege of an organisation putting a spotlight on their work? Do organisations put their money where their mouth is? Do they not only pay zine artists but do they promote zine distros, zine fairs, and spaces for the public to purchase zines? 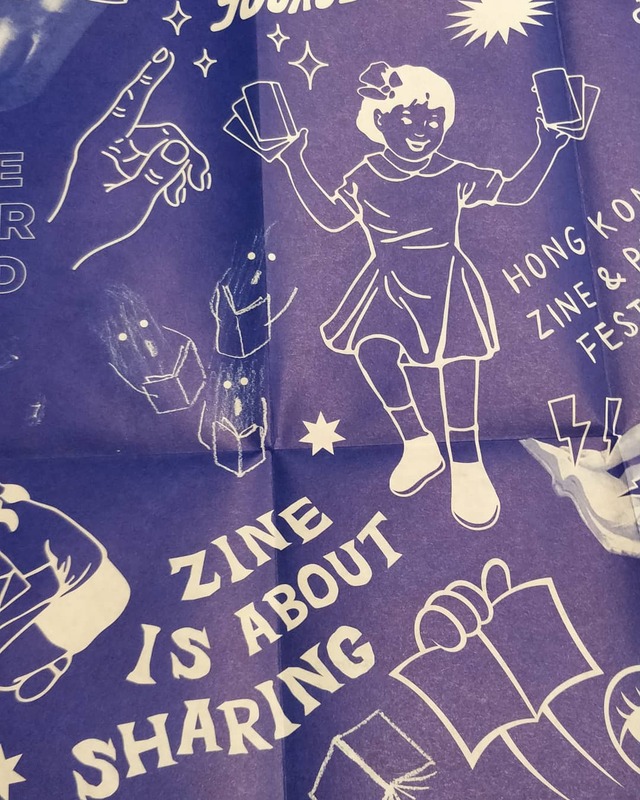 Do organisations treat zines as art objects? Are they used in displays and exhibitions to showcase a particular style or aesthetic, or is the value of their content truly appreciated? Other than when art organisations have asked me to for the sake of their press release, I really don't call myself a zine artist, I call myself a zinester or a zine maker. I do this because my zines aren't art objects. Sometimes there is a visual element to them, sometimes they are illustrated, sometimes they feature collage, but sometimes they just contain nothing but plain text and that's just as valid as the zines which Look Nice. What struck me from my residency was that these conversations are already in full swing and that activists and artists in Hong Kong connect with each other and forge ways for their materials to be shared and collected. That's not to say these conversations aren't happening in the UK and Ireland as well because they are, and as zine librarians we need to do better at joining in these conversations with zine makers. Although admittedly it's difficult, and a common theme from the week's residency is sharing with each other how stretched our time, staff, resources are, and how burnout in the library sector is real. 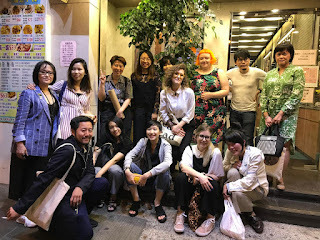 It was thought provoking and inspiring to see the ways that Asia Art Archive work with zine communities and nurture diy culture, and provide a place for authentic activism to be documented and preserved while also taking an active role in connecting diy artists and activists with each other. There is honestly just SO MUCH to say after this week and an in-depth report is coming soon. 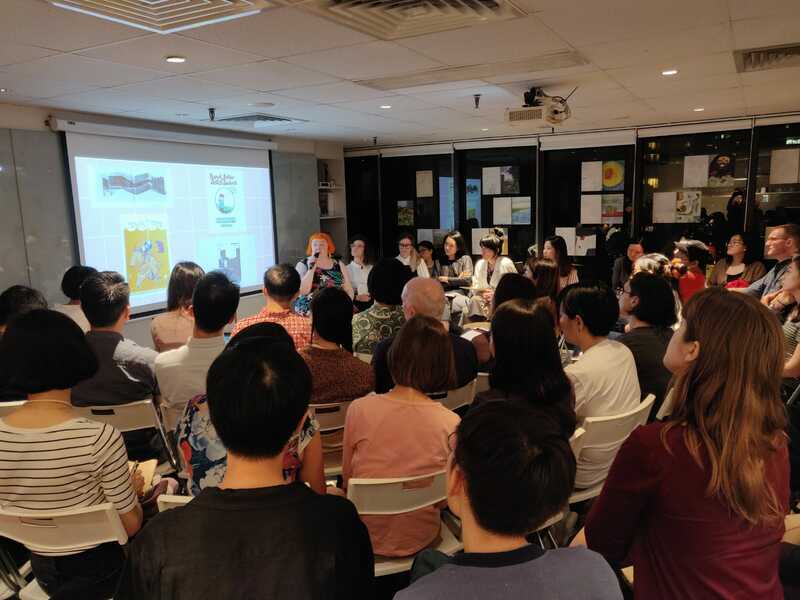 We'll be posting a full report over on the UIZL blog, we have a zine in the works, and we'll be sharing our findings at the next UIZL meetup this summer. But for now my head and heart is full of zines, and I'm just very thankful to everyone at Asia Art Archive and all the artists, activists, and librarians who were incredibly kind and gracious with their time. Especially AAA Collection Manager Elaine Lin who made this whole dream possible. It also made me realise that I talk about zine libraries a LOT but honestly I haven't made a zine in a hot minute and I kind of want to do that now. 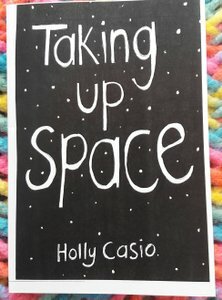 You can buy my zines here! Why it matters when we wrongly refer to artists' books/ independent magazines/small press comics as "zines"
My chapter about queering Bruce Springsteen lyrics is included in a new book on Bruce out now!